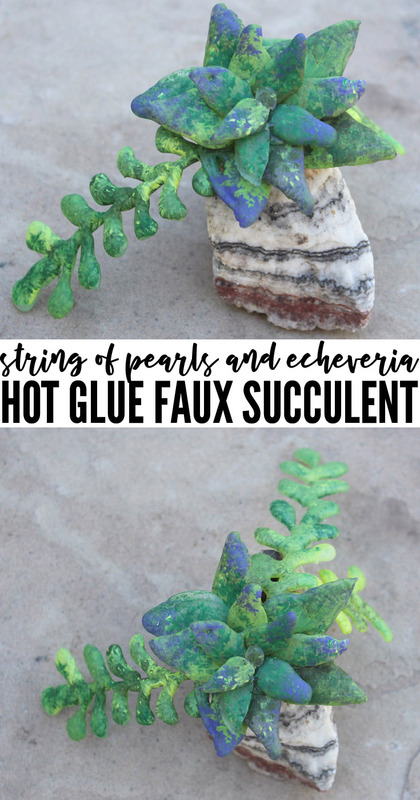 Doodlecraft: Hot Glue Echeveria + String of Pearls Faux Succulents DIY! Hot Glue Echeveria + String of Pearls Faux Succulents DIY! Hot glue is such an amazing craft substance--right!? It's been the mighty life saver many times when I've been crafting. For this post it is the star of the show. Simply turning hot glue into a faux succulent arrangement for decor or accessory. I love succulents and fake ones have been a blessing for me, since I have such a black thumb. This variety is totally DIY with very little cost and super quick to make! 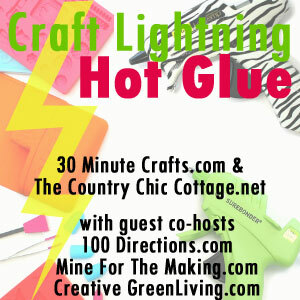 This craft is FAST and it's part of the Craft Lightning Hot Glue challenge this week! Check out the other fun Hot Glue crafts for more quick crafty inspiration! Hot Glue Hacks and Crafts! Begin by heating up the hot glue and piping a line across the baking mat. Then go in and add "tear drop" shaped pieces attached to the center line. Continue making the string of pearls as long as you want. Mine is about 6 inches. Then make tear drop shapes in small, medium and large sizes...about 5 each size. Let the hot glue set up on the baking mat. Then peel it off and place on a paper for painting. Get a variety of colors, or just one...whatever you have. Use a stiff paintbrush to coat all the hot glue in shades of green. Continue on all the leaves. Now it's ready to assemble. Get a rock or headband and get ready to hot glue those leaves together. You can use scissors to change any of the shapes as needed. Begin with hot gluing the String of Pearls on the rock. Then hot glue the biggest leaves around the top of the rock. Slightly overlapping and giving some shape to the plant. Fill in with the medium size pieces and then the small pieces on top. Again, clip down leaves as needed. Now it's ready to display. Kind of a fun planter craft to finish off in 30 minutes! Now, the hot glue will not adhere to the rock forever...but stronger glue can be used for a permanent fixing, like E6000. Or this can now be transferred to a headband for a Fairy, Mermaid or Mother Nature Halloween costume! This is great! Thanks so much for joining!